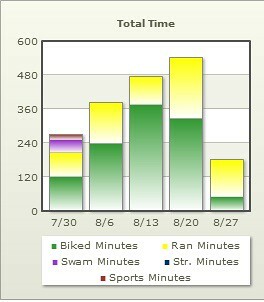 In August I snapped out of my training funk and had a nice build (except for swimming). Three progressive weeks of longer workouts left my legs tired and sore but in a good way. They were sore enough that I scheduled a deep tissue massage. I'm kind of a prude when it comes to people touching me so you know I was hurting. If you've never had a deep tissue massage, they hurt but in a good way. Definitely no risk of falling asleep like you could during a gentle massage. As the therapist grinded away at the knots in my calves then proceeded to move my quads around feeling like they were slipping back and forth across my thigh, I winced a few times. Anyway, it definitely helped and I'll probably go back during my next recovery week assuming I keep building up though I have no real race to build up for :-(. I am doing a half marathon at the end of October and probably Patrick's 12 hour run November 11th. I probably won't run all of it but I'll stay and drink beer and cheer for Patrick and whoever else can run for that long. Yep, no swimming in August. I just didn't feel like it the first two weeks and the pool was closed the second two weeks. I plan to get back at it this week. With last week being a recovery week and this weekend being a three day weekend I decided to smoke some chickens. I like smoking meat but it's time consuming and with all the training I've been doing, just haven't made the time for it for a long time. I have a large smoker and if I'm going to spend a few hours prepping and the better part of a day smoking, I usually cook a little extra. I decided to do pulled chicken since it takes a lot less time than brisket or pulled pork. 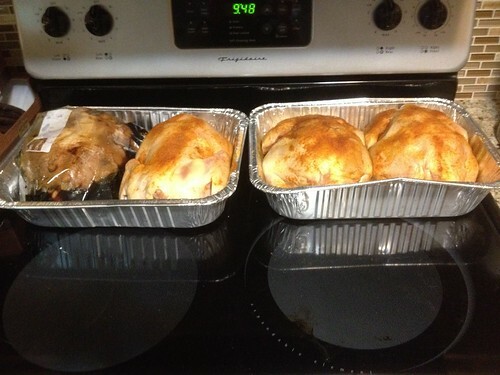 Yesterday I prepped the chickens. 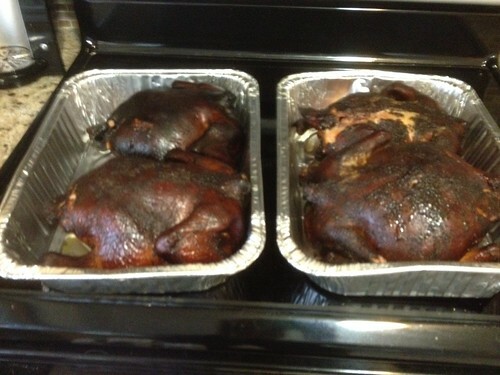 Three have lowery season salt on them and one is done in soy sauce (for those that don't like pulled chicken. 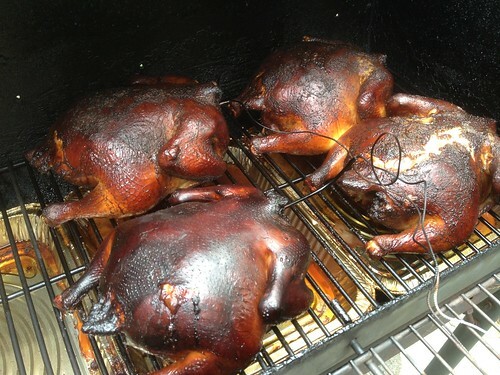 First step, light the smoker and get it up to 220 degrees F.
2nd step - arrange the birds with care. 3rd step - add fuel and wood chips that have soaked in water all night. I'm using hickory today. 4th step - sit on the couch and blog while watching the temp. I have three remote thermometers so I have one measuring the air and the other two measuring the largest of the four birds. 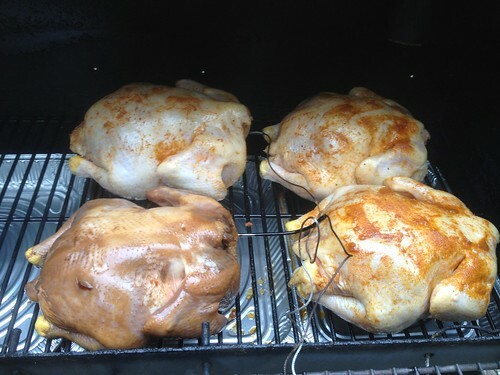 5th step - remove the birds when their internal temp is 165-170F. 6th step - let the birds rest for 10-15 minutes before carving. While smoking the chickens for hours, I made some black bean salsa. One of my favorite side dishes. I posted the recipe here and refer back to it from time to time. Yum! Nice job on the training! I HATE that no race feeling. :( I'm happy bc I have lots of stuff coming up, but the only one I'm actually "training" for is the Skippo 30k. 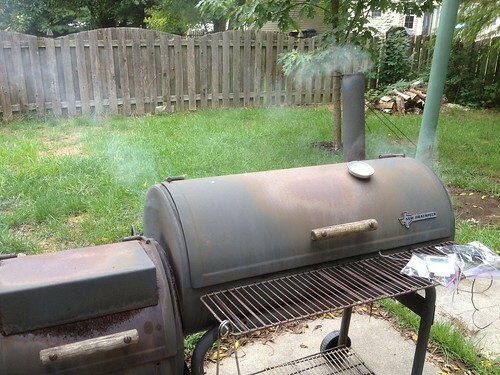 I always wondered how to smoke meat on the grill. It is so tasty! Now I will have to try it. 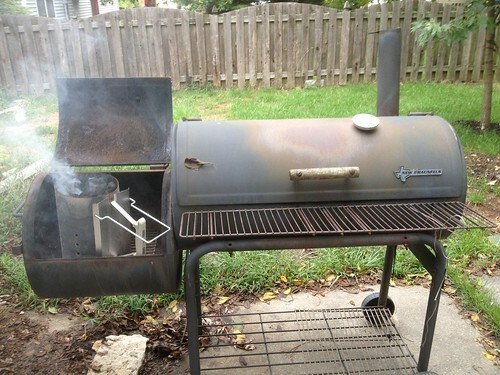 Where do you put the wood chips for a grill? I always thought you had to use a real BBQ. I'm seriously drooling!! My brother smokes a turkey at T'giving and it's the best meat I've ever eaten...I bet I couldn't not eat a whole chicken of yours :). Oh My Goodness I have never felt this hungry before! PLEASE come cook for me!!!!! Love black bean salsa and that chicken looks great! What is your favorite racing distance for running? Mine would be ten milers but there aren't many of those so I would pick half marathons next. I hope you have fun at yours. And I have no races right now on the books and I feel a little bereft. Out of the training funk!!! Yay! The birds look great. Thanks for the recipe... I love black bean salsa! Drinking beer while I run for 12hours might be cruel and unusual. Oh man what a project! I'll bet those chix were delicious. I grilled shrimp and ribs over the holiday weekend. And made cupcakes. Yes, all hell broke loose. I feel the same way about massage. I don't enjoy it but gosh I need it. Sports massages are so painful, but then 2 days later you feel like a million bucks! Totally worth it. 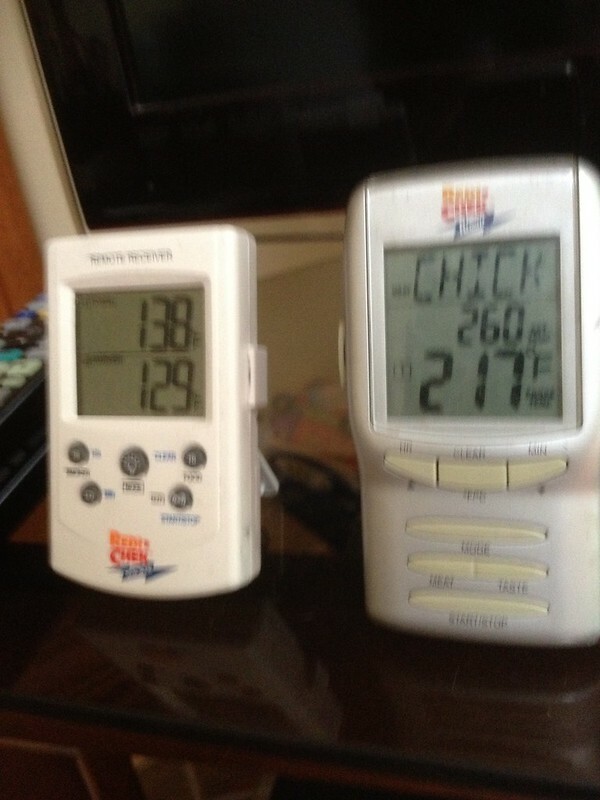 Those remote thermometers are so cool, definitely will look into getting some. You are quite the grillmaster! Yum! ummm...what time's supper? I'll bring the chips?????? I've barely swam since my race at the end of July... Right now our pool is closed for another week though, so I get a bit more time off of it.